Quick Tip: Scrub Your Tub with… Grapefruit? If you love grapefruit, here's one more reason to keep the sweet citrus amply stocked in your kitchen. There are plenty of housekeeping jobs that people put off. And as opposed to a task like clearing the gutters, there are few risks tied to not cleaning the bathtub. But it’s only a matter of time before you finally tackle the tub, with all its nasty soap scum and mineral buildup. When that day comes, you have no shortage of options, from potent store-bought cleaning agents to milder, all-natural alternatives. Surprising though it may seem, one method gives you the best of both worlds: It’s not only an effective cleaner, but it’s also pleasant to work with. Yes, it’s grapefruit. We’re used to hearing about all the many wonderful things you can do with lemons, but this time it’s a different citrus fruit that not only fights stains and germs, but also imparts a genuinely fresh, invigorating scent in the process. Depending on the size of your tub and the condition it’s in, you may need more than one grapefruit. But in any case, start by cutting one decently sized grapefruit in half. Next, coat the flesh of each half with a generous helping of salt. The salt works as abrasive that allows the fruit’s acidity to penetrate more deeply. Now run the shower or bath for about thirty seconds, or for as long as necessary to dampen the full length of the tub. Once it’s wet, sprinkle additional salt over the area. You’re now ready to begin scrubbing. Apply the grapefruit directly to the tub, and as you go, be sure to squeeze the fruit gently to release its juice. 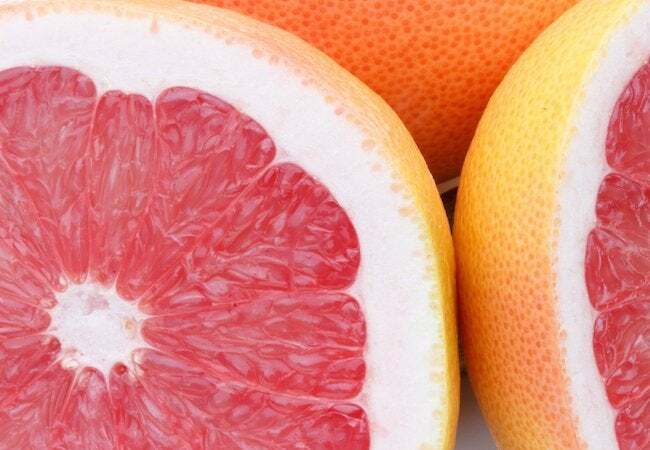 The most satisfying results come when the grapefruit juice and salt work in tandem, so add salt or switch to a new grapefruit half whenever you need to. For any particularly stubborn areas of residue, try scrubbing, not with the flesh of the fruit, but with its rind. Oh, and don’t forget to give some attention to the fixtures! Once finished, simply run the water to rinse away the leftover juice, pulp, and salt. 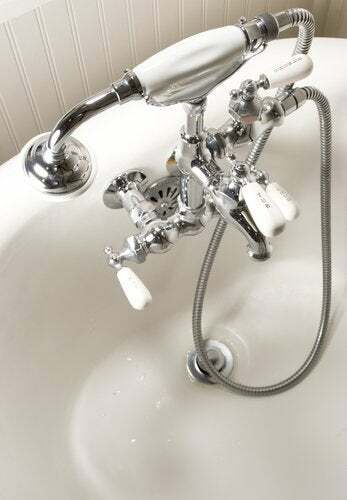 To wipe down the shower head, valve, tub spout and drain, use a clean cotton or microfiber cloth. That’s it—all clean, right? Of course, it would be silly to keep grapefruit in your house all year round simply in order to clean the bathroom. Rather than base your bathroom cleaning schedule around trips to the grocery store, you can prepare a grapefruit cleaning paste that’s easy to keep on hand in all seasons. Here’s how to make a small batch (double or quadruple the recipe, if it’s grapefruit season and you can purchase the fruit at low cost). 1. Halve the grapefruit and squeeze the from each half until you have a half-cup of liquid. Remove seeds. 2. Add one and a half cup of salt to the liquid, then stir until the ingredients are combined. 3. Transfer the paste to an airtight container. The next time you wish to clean the tub, apply the paste to a clean cloth and then scrub the entire tub, including the fixtures, washing or wiping away the grapefruit-and-salt remnants once you’re finished.